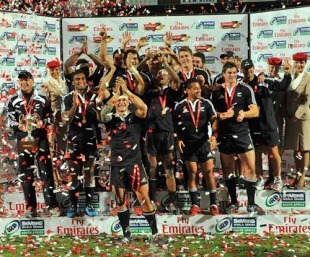 New Zealand made it two IRB Sevens Series titles in as many weeks with victory over Fiji in final of the latest event George. A week after capturing the season-opening event in Dubai, Gordon Tietjens' side beat the South Sea Islanders 21-12 thanks to tries from inspirational captain DJ Forbes, Ben Souness and Save Tokula. The Kiwis, who scraped into the last eight of the Cup competition, dominated at the breakdown and applied the same physicality that brought riches a week before in Dubai. They travel home with a maximum 48 points from the first two legs of the new season. Fiji are 12 points behind Gordon Tietjens' men, followed by England (28), Samoa (26), Argentina and Kenya (both 22). Reigning World Series champions South Africa currently lie eighth in the table with 16 points. South Africa's George title defence came to a halt against the Fijians in the Cup quarter finals, while the New Zealanders beat England in the tightest of matches and also came from behind to beat Kenya 17-14 in their semi-final, Zar Lawrence scoring the only try of the second half to clinch victory. Argentina had won a fine victory against the Dubai runners-up of last weekend Samoa, Pedro Garzon scoring the winner, but Pio Tuwai and Setefano Cakau were outstanding in the semi for Fiji as they came from well behind to beat them 19-14. England beat South Africa in Sevens for only the second time on South African soil, to claim a hyper-competitive Plate trophy and take 12 points towards the World Series. The last time an England side had beaten the Boks on their home patch was in 2003, but with Christian Wade, Jake Abbott, Ben Gollings and Isoa Damu in inspired form Ben Ryan's side ground out an impressive 21-7 win, to the dismay of the partisan crowd. Earlier, Marius Schoeman and Mpho Mbiyozo had been on top form as South Africa recovered from the disappointment of losing in Cup quarters by beating Samoa in a tight match 10-7 to reach the Plate final and England also bounced back from their Cup loss against New Zealand to beat Australia. Overall it was a brave effort by the under-pressure South Africans who were missing six of the players who won the title here last year - Paul Delport, Renfred Dazel, Gio Aplon, Robert Ebersohn, Ryno Benjamin and Vuyo Zangqa. Russia again proved that they are an increasing power in the game with a fine win against the USA to win through to the Bowl final - one better than last week in Dubai - but in the end Wales proved too strong for them in a 14-5 final win. Lev Slepstov scored late on for the Russians, but the World Cup winners had Craig Hill and Lee Rhys to thank in a tight match as they took the Bowl for the second time in two weeks. Scotland ended a disappointing two weeks of Sevens on a positive note by beating France 28-19 to clinch victory in the Shield. Andrew Turnbull and Grant Anderson each scored two tries as Stephen Gemmell's side came from behind in the first half and finished the stronger.